Democrats do a lot of things better than Republicans. First and foremost, they stick together, they fight together, they plan and coordinate their battles, and they help one another. There is a tremendous amount of power in that. Democrats also happen to be slimy, corrupt swamp rats who would sell their mothers into prostitution. Generally speaking. There are a few exceptions. Republicans tend to be ladies and gentlemen, standing idly by as Democrats in Florida and Arizona brazenly steal elections in broad daylight, right under their noses. Oh, sure, they squeal with the most righteous indignation when a reporter sticks a microphone in their clueless mugs. Then, they clap one another on the back and head to the bar. 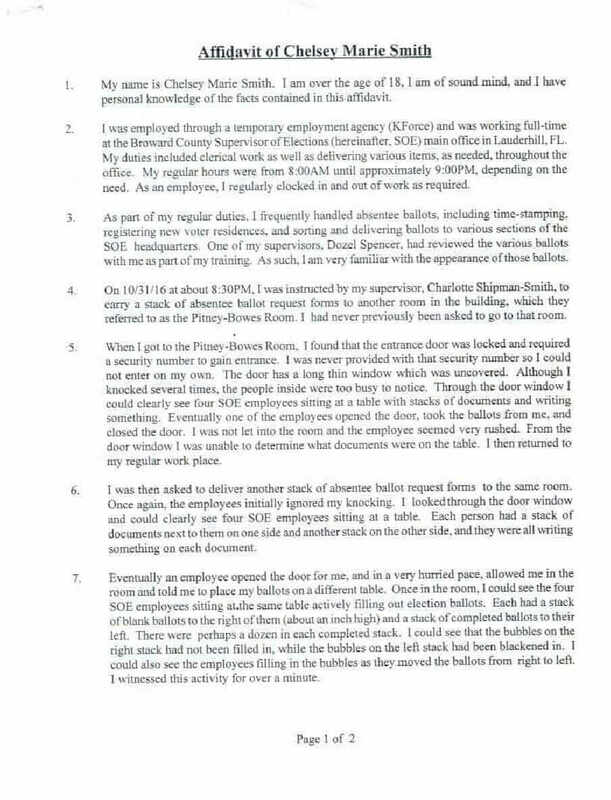 It is sickening enough to witness this travesty unfold, Democrats mysteriously producing truckloads of “found” ballots that they insist must be counted to ensure fair elections, but it is even more sickening to watch as Republicans stand by and allow themselves and America to be cheated out of fair and honest elections. 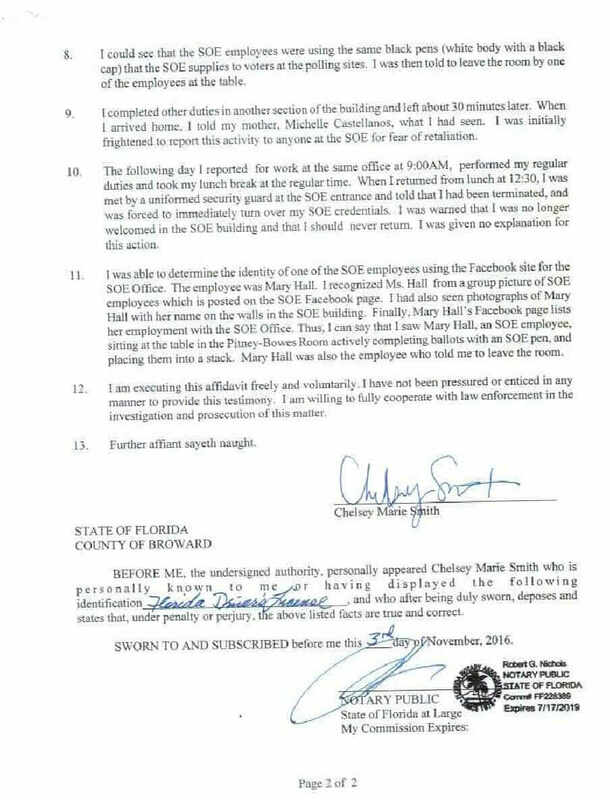 There is ample public evidence, particularly in the Chelsey Smith affidavit (below) to arrest and indict Broward County’s Supervisor of Elections Brenda Snipes and most of her staff. 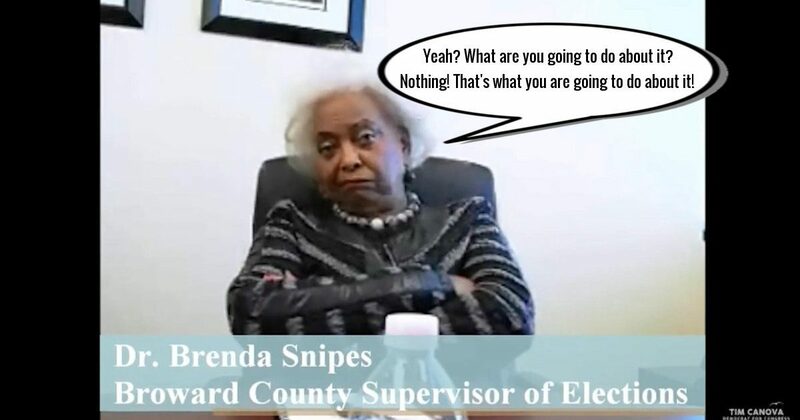 Yet, every day Snipes totes in another box or ten of “found” ballots, and, mysteriously, most of them are votes for Democrats. This will continue until Governor Gillum and Senator Nelson are declared the winners. The same thing is happening in Arizona. And Republicans are doing NOTHING! George Soros, whose money flows freely through dozens of companies, bound for those who will do the liberal Democrats’ evil bidding – Antifa, Black Lives Matter, and a host of other contemporary agitator/criminal organizations, should have been charged with sedition decades ago, locked up, and his assets and the assets of all of his companies frozen, for, as with all terrorists, cut their money source and they go away. Yet, the Republicans do NOTHING! Unlike Republicans, Democrats take very good care of one another, supporting their brethren through thick and thin. Not so, Republicans. They routinely fight and bicker amongst themselves and form splinter groups and cliques as diverse as the McCain Rino cabal, Freedom Caucus, and Tea Party, all claiming ownership of the conservative brand and label. While they fight for supremacy within the GOP, the Democrats run circles around them, leaving them bewildered. The Republicans enable the Democrat Party, allowing them to commit any crime without so much as a slap on the wrist. Hillary Clinton should be doing serious time, yet she is preparing for another presidential run. With all that she has done, with all of the evidence against her, the Republicans, who have owned every branch of government for nearly two years, have done NOTHING! So, now we are seeing the fruit of the Republicans’ new and improved enabling of the Democrats – the brazen, transparent theft of critically important elections, in broad daylight, right under the noses of We the People. And the Republicans do NOTHING! And, if you think the Democrats’ theft of elections in 2018 is egregious, wait until you see what they have in store for 2020 if the GOP simply allows them to get away with this. It isn’t only beltway Republicans who refuse to help one another. This lack of support for fellow conservatives goes all the way to the grassroots. In 2014, retired Army Colonel Harry Riley founded a movement he named Operation American Spring, the goal of which was to mobilize millions of patriots whose mission was to march on Washington and remove Barack Hussein and a handful of other career parasites from their positions in our government. John Boehner was also on Riley’s list for removal. Riley vowed to not leave Washington until Obama was deposed. I was very hopeful that the event would spark a peaceful revolution and restore America’s faith in its government. I supported Colonel Riley every step of the way, publicizing the event back in the days when Fascistbook didn’t manipulate conservative traffic and I was able to reach millions of patriots instead of the few thousand I am able to reach today. In early May, 2014, Colonel Riley informed me that he had commitments from over two million patriots who vowed to show up in Washington and participate in the event. On the big day, May 16, 2014, when two million patriots were scheduled to show up to kick hope and change out of Washington, a tiny crowd of two thousand is all that materialized. The mainstream media reported with glee the anemic turnout. When push comes to shove, those who call themselves “conservatives” are not very loyal and supportive of fellow conservatives. While on the subject of the term “conservative,” I must point out that I don’t care much for it. I call myself a “patriot,” not a “conservative,” a term that I believe has been hijacked by a number of mostly single-issue groups that hide behind the term for the clout it affords. Another example of patriots abandoning patriots is very personal, and, frankly, very painful. Facebook, Google, and Twitter began their war against conservative publishers in January, 2017, nearly two years ago. We, in the right-wing blogosphere, were instrumental in electing President Trump and they knew it. The powers that be at Facebook, Google, and Twitter recognized the power of the right-wing blogosphere in electing President Trump and vowed to do all they could to prevent it from happening again, which meant destroying the traffic, thus income, of conservative publishers like me. My traffic and income have dropped in the past two years by 98%. Imagine making $2,000 a week at your job, and slowly, gradually, a little more is taken from your paycheck every week until after two years, your weekly paycheck has dropped to $40. That is what has happened to me and many other conservative publishers, many of whom have gone out of business. In desperation mode and somehow imagining that fellow conservatives would rush to help, I began a GoFundMe page a month ago to raise money for legal fees to sue Facebook for destroying my website, my livelihood, and my life, and to sustain our operations for two years to help re-elect President Trump. In over 30 days, the effort has raised $190 and $60 of that is from my wife. I post the link to my GoFundMe page twice in every article I publish. I will likely be out of business in a few months without help. If anyone reading this knows of any way to help publicize my GoFundMe page (link at the end of this article), by all means, please do. I will be eternally grateful. Do President Trump and the GOP not understand what the death of the right-wing blogosphere means to them? Do they actually expect to receive fair treatment from the mainstream media? Who will be their voice, their supporters and cheerleaders if we are gone? Who will fire up the grassroots? No one. Unlike liberal Democrats, conservatives simply do not help fellow conservatives. It is a shame and a very big problem that will likely lead to the end of America as we know it, turning the country over to the Democrats, which, as we know all too well from experience, will lead to disastrous consequences for the country we love. Washington will have its claws around the throats of We the People again, our borders will be wide open to the invasion of tens of millions, perhaps hundreds of millions of undocumented Democrat voters, and two classes will emerge to dominate America – the rich, elite ruling class and the rest of us who will be no more than a serf class, giving the government and elite nearly all that we earn to support the hordes who invaded our country without resistance (these people are not PhDs and will consume all that we are forced to give until we have no more to give). Corruption and crime will be rampant and there will never be another chance for conservatives to restore the once great America. All because Republicans will not stop the demonic Democrats when they have the power to do it and those who call themselves conservatives refuse to support fellow conservatives. There are liberal Democrats in very high positions in both the public and private sectors who are clearly guilty of sedition and some even guilty of treason, in my opinion. Not only are they not being called to answer for their seditious and treasonous activities, they are further emboldened by the lack of resistance from the Republicans. It’s as though America is a mugging victim in a public park with the GOP casually enjoying a bag of popcorn while watching the mugging from a nearby park bench. Openly, brazenly, and in broad daylight, the mugger robs America of all that is worthwhile and then declares with a smile, “I am going to slowly, a fraction of an inch at a time, push this knife into your heart and you are going to do nothing about it,” then proceeds to do it as the Republicans watch. At this point, I have every reason to believe, and no reason to believe otherwise, that America is finished.